Agree with you on the decrepit facilities available to tourists in Mexico. Or do you just like to take potshots at Jews? There is NO valid comparison between the holocaust and the defensive measures taken by the State of Israel, except to a amoral lover of “progressive” dictators like ex-Pres. Jimmy Carter. I was going to respond to the post as a comment, but got carried away. Too much text for a simple ‘comment’ so here it is, in post form. Hey, thanks for stopping by and insulting me! Always appreciate the right wing coming in, fist in the air, to invalidate anyone else’s opinion. I especially enjoyed the Dictator Carter remark – made me laugh out loud and that doesn’t happen often in these troubled times. Thinking back, and now that you mention it, I distinctly remember his militant Carter Jugend, with peanuts embroidered on their short sleeved shirts as they tramped through the streets of Georgia, shouting “Down to the Cashew Eaters”. It has not escaped my attention, as you suggest, that there are missiles being lobbed and Israelis being snatched. Perhaps it has escaped YOUR attention that the retaliatory measures Israel has imposed are not limited to a blockade designed to magically starve out the bad guys, but has also included bombing on any and all possible targets, civilians be damned, as well as Palestinians being harassed, beaten and arrested. My point was that a people (Israelis) who had suffered so much, would perhaps have a bit more compassion than say, the USA which in the last few decades dumps bombs first and asks questions later. Another interesting idea that just popped into my head is that the Mossad is one of the world’s best ‘intelligence’ and ‘covert ops’ outfits. Do you not think that they could perhaps do some infiltrating and bring the perps to justice, much like the USA could have done after 9/11 instead of randomly invading Afghanistan? Back to the blockade – which is not on again, off again, but has been a continuous thing – and which is supposed to somehow make the Palestinians say “Oh, OK. Um, yeah. Let’s get those bad guys that are hiding among us and turn them over to the nice Israelis who have shown that they are more than willing to deal with us fairly”. Let’s see. People are starving, they have no food, water, electricity. Medical supplies. Students accepted abroad cannot leave thank you very much. If this was happening in your redneck town, do you think you would get perhaps just a little pissed off and might consider JOINING those criminal elements in Redneckville instead of turning them in to the authorities that are starving your kids? Hmm. Tough one. And, blockades work so well. Look at how effective the Cuban blockade has been. Thanks to the USA, we still have a communist country in this hemisphere! I am by no means taking potshots at Jews. Where the hell does that idea come from? What hyper-sensitive part of your brain picked that up? In mentioning the holocaust, I merely imply that (I am repeating what I mentioned above, in case you didn’t get it) one would expect a little more maturity from a people that has been through so much. Staying on-theme with the tourism comments in the previous posts, I wanted to quickly give you my impressions on the state of the art facilities at Ek Balam. Ek Balam is one of those Mayan archaeological sites that is not in the same league, promotion and money-invested wise, as say, Chichen Itza and Uxmal, it’s more famous cousins. Along with Mayapan and places like Aké, it is a site seen by far fewer visitors and usually only on the itinerary of the more die-hard Yucatan explorer. There is, however, some government involvement in the restoration and running of Ek Balam and so we have the caseta de cobro where all visitors must stop and pay their fee to enter the site. Presumably the entrance fee covers basic maintenance and the salary of the sour-faced employee who has no knowledge of basic math (addition and subtraction) and is allowed to have no change on hand for breaking anything larger than a 20 peso bill. Also, and in spite of being a government-run site, which should imply some sort of amiable exchange rate for the almighty dollar, the rate offered is considerably less than that provided by the banks. The highlight of the awful, unpainted concrete monstrosity making up the entrance is – as is so often the case – the bathroom. Maybe I have a bathroom fetish but as a resident of the Yucatan and occasionally charged with the responsibility of ferrying relatives and friends to these ‘touristic’ places, I feel enormously embarrassed at the crude-ness of the facilities provided to the tourists our government is trying to woo. Please look at the photos below. 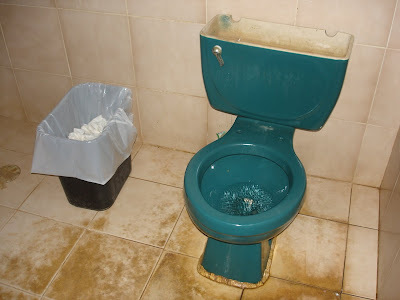 This is the welcome, as in the case of the previous post on Progreso, that tourists and visitors will have should they require the use of a bathroom. Next to the toilet, please note the traditional waste paper basket containing used toilet paper. Heaven forbid that they should make the effort to actually install a proper septic system that can handle toilet paper! And after your precarious hovering experience – note the absence of any toilet seat or something to hold onto when you are in fact, hovering – with the toilet, you can proceed to the modern ‘sink’ and dip your fingers into that charming little plastic dish of brown liquid soap, where unknown hands have dipped before you. This primitive set-up would be fine if perhaps, I was camping, although I have seen campsites with outhouses that look more hygienic. Or visiting someone who was very poor. But this is a federally (INAH) and state (Secretaria de Turismo or Cultura) run attraction. They spend all kinds of money, not so much the INAH but the Tourism people, on ads and campaigns and and and to get people to come here. Then, when they do, they offer them this. Yes, the Mayan civilization was very advanced and has left a cultural legacy that has endured for thousands of years. Those days, however are gone. In the absence of anyone in government building or doing ANYTHING these days to make the Yucatan more attractive or even a better place to live for its inhabitants, these Mayan sites are a cash cow for the mindless, unimaginative and self-serving bureaucrats that run them today. They should be turned over to the private sector and all the leeches living on the proceeds of the Mayans remains should be forced to get a real job. I have been saying lately, and after having lived here for 20-plus years, that the real name of Progreso should be Atraso, since the word progreso means progress (atraso means the exact opposite) and that is the last thing that this little town has seen in the 20 years of my living here. Cruise ships arrive at the port and disgorge inordinate amounts of somewhat curious tourists (they can’t be that curious if they are taking a cruise) who then either take some sort of guided tour or amble about the town, Corona in hand, oblivious both to the stares of those locals who are working or going to school and also the shouts and whistles of the simian-like vendors trying to bring the tourists’ attention to whatever trinket they are hawking on little tables set up on the crumbling sidewalks. The tourist busses from the ship arrive at the Casa de Cultura (House of Culture, or Cultural Center) which as its name implies, showcases the culture, or in this case complete lack thereof, of the town. While I am not dissing the people of Progreso per se, I certainly am dissing the authorities that over the last 20 years have done nothing tangible for the people of Progreso, nor have they made any effort to make the port attractive in any visible way. The “Cultural” Center itself is a maze of pseudo market activity (it only materializes on cruise ship days), with everything from honey to stone to clothing. Anything produced in the Yucatan in it’s infinitely limited variety is on display, one booth differentiatable (is that even a word?) from the next only by a different yawning or gum-chewing and completely bored person staring listlessly into the distance, numbed by the sheer number of chubby foreigners walking by. There is a long lineup of tourists waiting to have their turn at purchasing one of the many ‘authorized’ tours available; Dzibilchaltun, Merida and points beyond. One couple mentioned they had paid 28 USD for a trip to the Marina Silcer, presumably to drink themselves into oblivion or something since I cannot for the life of me imagine what else they would do there. Another table set up sells the Progreso tour, which takes place on giant, partially painted metallic structures on wheels that in a previous life had perhaps been busses, but are now double decker open air cattle corrals with blue seats upon which the hapless tourists perch their generally ample bottoms, while enjoying the sights, sounds and smells of Progreso. The ‘guide’ is up front, microphone in hand, pointing out the few highlights that remain after decades of neglect, which logically includes those shops that have good prices (and have most likely previously paid for the privelege of being named in the tour) in a Cancun way that anyone familiar with the ‘hey amigo‘ time share crowd will recognize immediately and with some concern. You can buy Cohiba cigars right there on the street! Yes, authentic cigars for those victims of USA foreign policy and addicted to tobacco. I am unqualified to judge whether or not these are real, but we are in Mexico and anything is possible; therefore, I have my suspicions. Back to the ‘Cultural’ center; inside, there are barely-painted walls with works of art ie paintings hanging on them along with a plastic nativity setup complete with Chinese lights. The paintings are minimally lit. Not minimalist. Minimal. Some flourescent tubes here and there. In one corner, and deserving of a very special mention, are the bathrooms. These are a particularly 3rd world welcome for those tourists needing a WC. There is a table featuring the lady with a shallow basket containing previously torn pieces of toilet paper (there is none inside) and another basket that sports a hand-lettered black felt pen sign: “Tips”. You must tip to pee. Men are waved into their bathroom (which has a sign, but perhaps you will miss it and this gives the lady a chance to ‘earn’ her tip from you) while the women are stopped as they enter their bathroom by the outstretched arm and hand holding a basket full of toilet paper pieces. They stare at the basket, then at the lady and back at the basket, unbelieving and not comprehending the gesture. That is, until the lady authoritatively says – in what is probably a major portion of her English vocabulary – “toilet paper!” Then it suddenly dawns on them as to what they can expect inside and they gingerly take the pieces they feel will be needing. I did peek inside the men’s stall and was able to confirm that there is no semblance of an actual toilet seat, just the bare porcelain over which you will suspend your anatomy as… well you get the picture. 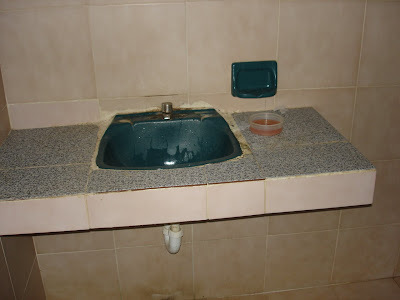 Washing your hands will also present the no-soap and no paper towel dilemna, unless of course you ask the lady outside – I am sure she can help. This is the environment in and around the Progreso de Castro Cultural Center. A truly retro and cliche-reinforcing welcome for the very people Progreso claims it and the Yucatan government is trying to attract so that there can be some economic trickledown. send whoever is left to Campeche to learn how make a malecon (boardwalk) properly so that tourists and locals can enjoy the beachfront safely and in comfort. There are more of course. But this would make a great start. All in all, a very entertaining morning! Check out the price of a six pack of beer in this furtively-taken cell phone photo. All the Mexican beer is prices at upwards of 45 pesos per six pack and this beer, which is not bad at all, will set you back less than 40 pesos a six pack, and it’s brought over from Holland. A NotTheNews Shout Out to the Israelis! Don’t know much about history, or so the song goes. I don’t know much about the Gaza blockade, but it sounds like a real piece of work coming from a people who suffered a holocaust. Also a great way to Win Friends and Influence People on the international stage. Most of you already know that Merida, the formerly white city, now boasts among its many attractions, an ice rink where public skating is offered to those Yucatecans (and people who have that aspecto fuereño thing going on) brave enough to overcome their reluctance to rent skates that were worn by who knows who and take to the ice. Located in the Galerias Liverpool mall, the ice rink is also used for – get this – hockey practice! Being a Canadian, it was certainly strange to observe a group of kids ranging from 6 to about 14 years old decked out in full hockey regalia, shooting frozen pucks around the rink while shoppers and passersby watched with interest and amusement. What I thought was interesting was that when the practices were over and a little scrimmage or mini game was played, it became evident that the referees (teenage kids) did not have a whistle! I can’t envision any kind of hockey practice without the shrill sound of a referees whistle, and it did seem to make it harder for the referees to get their point across during the practice. But the overall impression was of how small the world has become, when you can buy salsas El Yucateco in any grocery store in Canada and play (or watch) ice hockey in Merida. Another one of those great finds, La Chozita is located in front of the multi-million dollar investment white elephant known as the Hospital de Altas Especialidades or something equally pretentious (isn’t it great how a country as poor as Mexico can spend this much money on a first-world hospital and then not open it?!) in that newly popularized part of town known as AltaBrisa. Yes, where the mall is. This little gem is located across the street from all that shiny new commercialism. There is a palapa roof to identify it with; right next door is a tiny cibercafe where one can presumably check email and surf the web. Parking is on the street in front and there are 4 tables. La Chozita is home made Yucatecan food and had been previously recommended to the Critic. The wait seemed eternal; a full 20 minutes passed from the moment the very smily cook came out of the kitchen to take the orders, carefully writing down the very complicated order of salbutes, polcanes and empanadas to when the first food actually appeared in front of the ravenous Critic and the BH. As a friend would say… “To Die For”. This was so good it was ridiculous. The empanadas were crispy, the salbutes were as well and that carnitas were tasty. Everything was freshly made, and fried to order. Unreal. The habanero and separate tomato sauces were a refreshing, biting complement to all that fried masa. 5 salbutes, 1 polcan, 2 quesadillas, 2 cokes and a bottle of water came to the even more ridiculous amount of… ready for it? $80.00. PESOS!!! Even with a $20 peso tip, this bill for lunch for two came in at under $8 USD at today’s exchange rate of $13.75 pesos/1 usd. SPECIAL NOTE TO THOSE STAYING AT THE IN KA’AN GUEST HOUSE – this is just around the corner from you! Tacos de Jiba could be translated as ‘hump’ tacos, since they refer to the jiba on the backs of the local cattle, which are the hump-backed variety. If you can get over the image of eating meat carved from that bump, you can try the tacos at this taqueria located behind the Gran Plaza shopping mall. The sign looks promising, and the location is perfect for an after-work bite. Unfortunately, that is about all that is good about this place. There is one, hapless waiter and what seems like someone’s grandmother in the kitchen (although this cannot be confirmed because you cannot see the kitchen) since the food preparation is extremely sloooooooooow. Once you are seated, the little man comes over, leaves you a menu and takes your drink order and after some time returns with that and then will take your order. On this occasion, the Critic and his BH ordered a guacamole to start and 2 orders of tacos. After what seemed like an eternity, during which time the Critic enviously eyed the crepes coming out the kitchen next door (the tables are mixed together, some for the crepes place and others for the taqueria) and began to chew on the potted plants nearby, the first order of tacos arrived. Just one, mind you to make the meal more interesting. Half the party waited patiently while the other half said, go ahead, they’re going to get cold. After some time, the waiter passed by and the guacamole was asked for. It’s coming. Then it came out and after another short wait, the other order of tacos was brought to the table. There were cutlery issues as well but the over-all impression was of extreme slow-ness. And how were the tacos? Nothing to write home about. For just over 100 pesos you can eat here, but don’t come hungry or expect any kind of service. You are far better off at the million other tacos places in Merida. Rating: 2. Don’t bother unless you are totally desperate and have no car to get anywhere else.